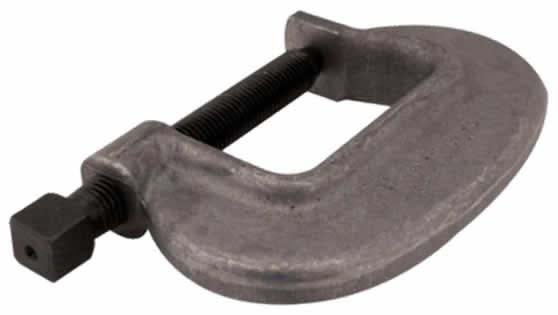 This bridge clamp is especially designed for heavy duty service and the frame is manufactured of drop forged and heat treated for maximum strength and reduced springing. The screws are made of special grade steel and are heat treated for added strength not found in typical case hardened screws. To tighten this C clamp the square headed screw must be turned with a wrench. It is ideal for the most demanding applications such as construction and heavy industry. It has a greater anvil surface for gripping larger work-Pieces and for greater stability.